After getting your Cortex-M development board now its time for getting started with MCUXpresso IDE. 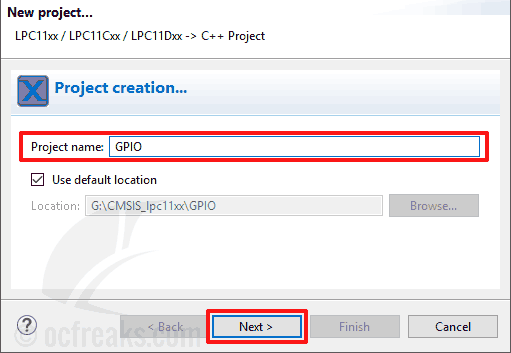 In this Step by Step tutorial we will go through how to create projects in MCUXpresso IDE for Cortex-M series Microcontrollers by NXP(Founded by Philips) based on CMSIS (Cortex Microcontroller Software Interface Standard). 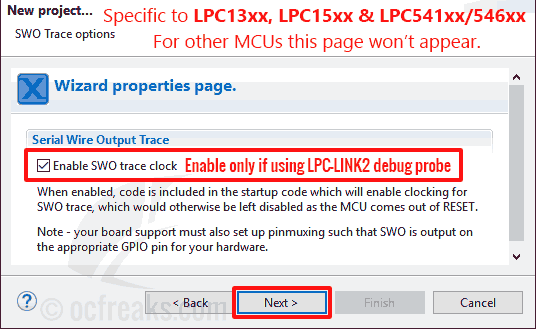 MCUXpresso is a derivative of LPCXpresso and Kinetis Design Studio IDEs with combined support for LCP and Kinetis MCUs. 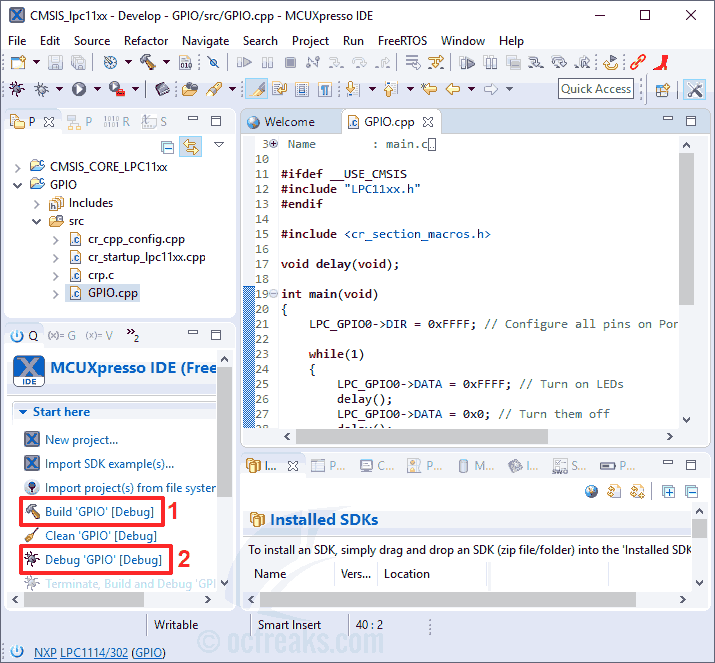 The IDE comes with integrated arm-gcc compiler and all the necessary debug drivers like LPC-Link, etc.. to get started with rapid embedded systems application development using your Xpresso board. Both older and newer boards are supported. This guide is applicable for NXP’s Cortex-M MCU families like LPC800(e.g. LPC81x), LPC1100(e.g. LPC111x), LPC1300(e.g. LPC134x), LPC1700(e.g. LPC176x), LPC4300, etc. 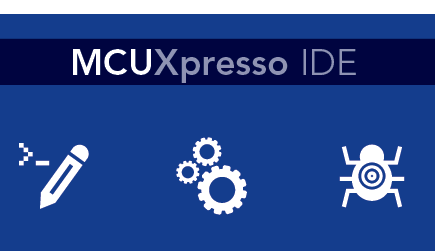 After creating MCUXpresso projects with CMSIS, the IDE will automatically add all the necessary startup files(for initializing MCU), headers and a project source file(C/C++) depending on the settings we choose while creating project. After download, install from the setup file using default settings. 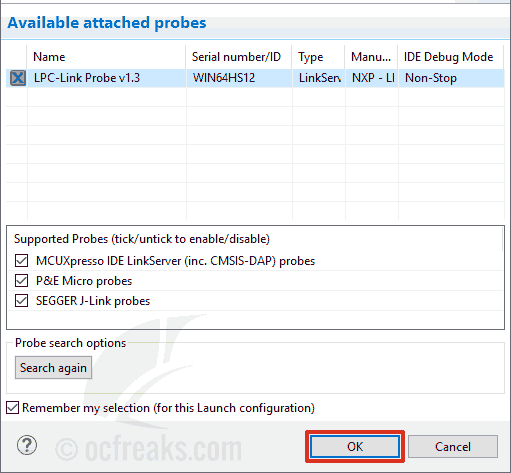 During installation it will also install debug probe drivers which is also used to flash the code. Just click Yes/Next/Accept if its asks for driver install confirmation. 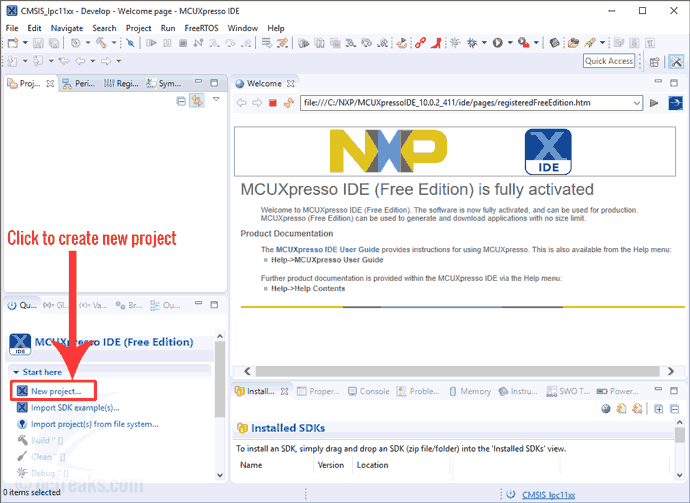 By default the IDE will install to location – C:\NXP\MCUXpressoIDE_<version>\. 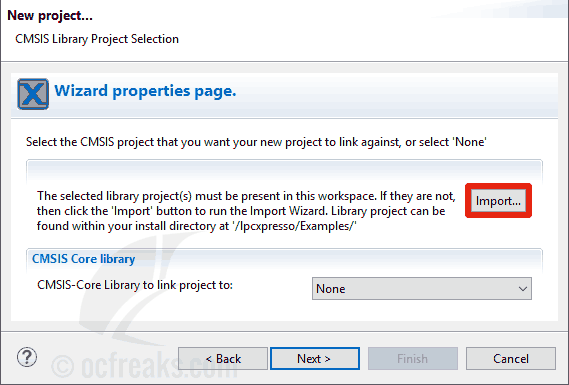 After install follow the steps below to create a new project. 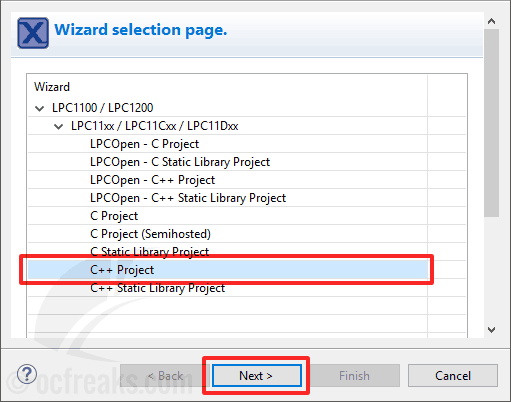 In this guide I have shown project creation using LPC1114/302 as target, as an example/demo. The steps will be same for other Cortex-M series MCUs like say LPC1769. I have provided workspace archives containing example projects for LPC812, LPC1114, LPC1343 and LPC1768/LPC1769. Download links are given towards the end of this tutorial. 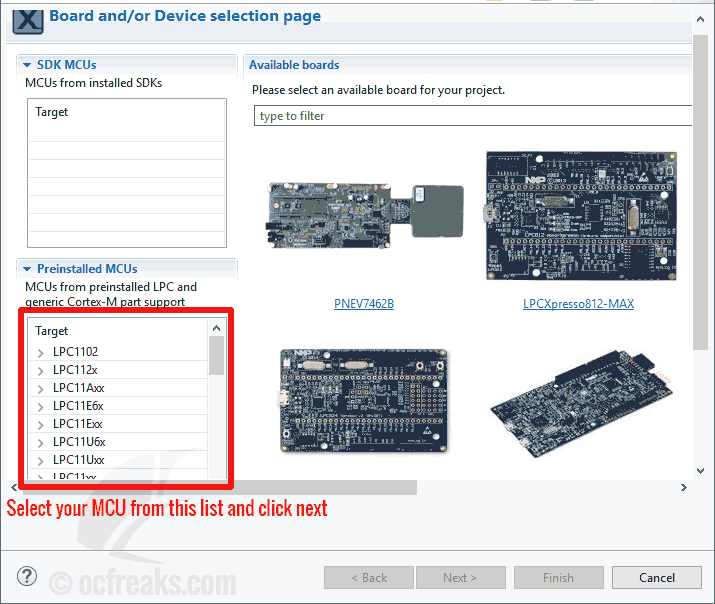 Step 7: Now under “CMSIS Core library” select CMSIS_CORE_LPCxxxx for your MCU family and click Next. 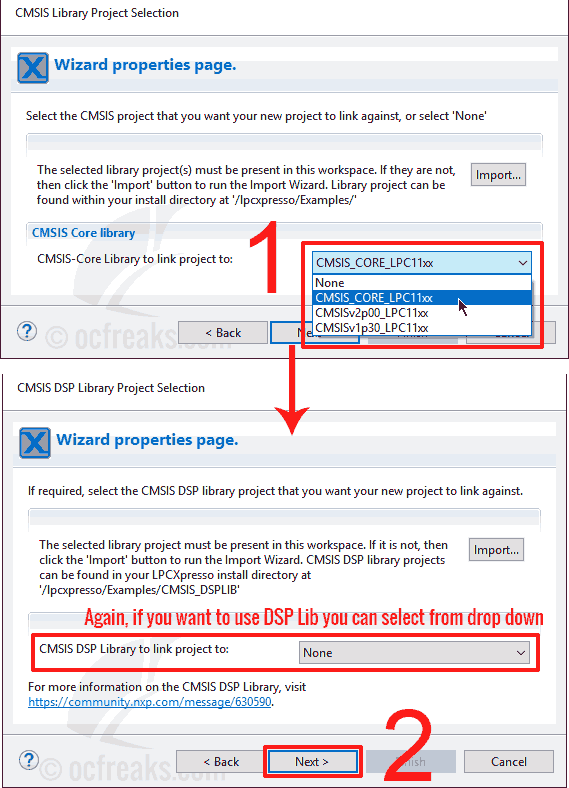 In the next screen, do the same for CMSIS_DSP library if you had selected it in step 6. Or select “none” and click next. Attention: After this stage, depending on your target MCU family MCUXpresso may ask for a few more debugging related options. For other MCUs these page(s) won’t appear. Extra options specific for LPC8xx & LPC11U6x/E6x Target MCUs (Ignore this for other MCUs). 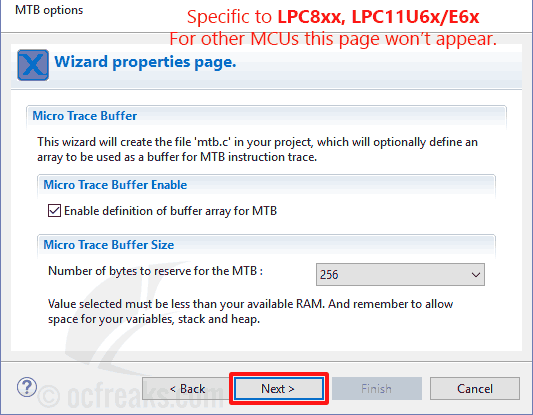 This option is used to enable or disable MTB (Micro Trace buffer) which provides a method to collect details about the instructions being executed. Even if you disable this, still a file named “mtb.c” will be created in your project which defines the array variable which is used as trace buffer – but the code will be not compiled since C/C++ Macro definitions will disable it. If you choose to enable it, you can change the buffer value any time in the IDE. Step 8: The IDE will now create a project with the settings we selected as shown below. 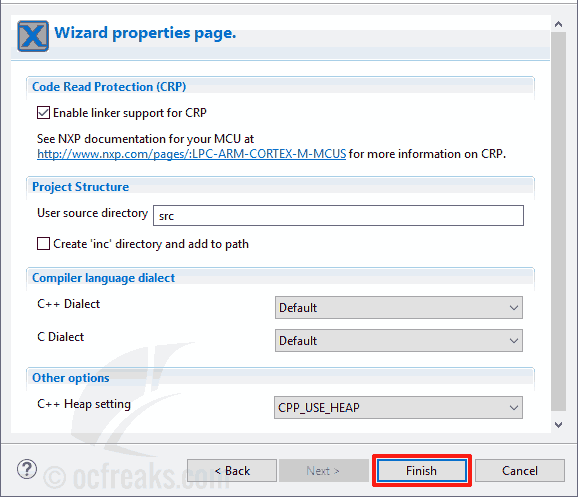 The name of the source file containing the main() function will be <Project-Name>.cpp. When you are ready with your program you can click “Build” under “Quickstart Panel” to compile. How use/import the zip archive? The zip files given above contains archive of workspace which includes the individual project and CMSIS library. Just unzip it a suitable location and open the location as workspace in MCUXpresso. You can import the workspace zip as project from the IDE itself from “File->Open Projects from File System…” menu – note that contents of the zip will be imported as project into the existing workspace.